Law academics have returned from a successful visit to Japan, bolstering the Memorandum of Understanding signed by the City Law School and Tokyo's Keio University Law School. 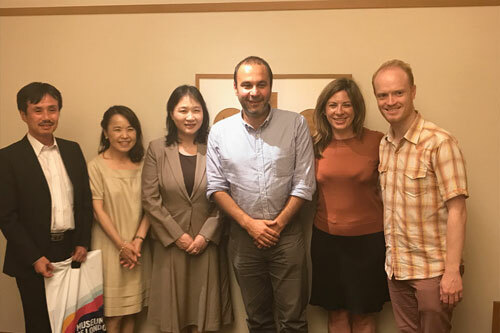 Five City Law School academics have recently returned from a successful visit to Keio University Law School in Tokyo. While in Japan they taught courses at Keio University's summer schools, seminars and on a law practice series, including sessions titled 'The EU as a Global Actor', 'European Intellectual Property Law' and 'International Investment Law'. The visit, which took place during August and early September 2017, was funded by Keio University, the Japanese government and intellectual property practitioners network associations. Following the signing of a Memorandum of Understanding earlier this year, City is hoping to further expand the partnership to include political science colleagues at Keio's Jean Monnet Centre for EU Studies. Professor Makoto Shimada, Professor of International Commercial Law at Keio University Law School, was a Visiting Scholar at City Law School during the last academic year. The City Law School academics also visited Kansai, Waseda and other Japanese universities to develop research projects and give talks at Chambers of Commerce.